Wake up to the most beautiful ocean sunrises streaming in through your lanai windows! You want that great unit right on the ocean? This is it! This terrific unit features a full kitchen, King-size bed, and tile flooring throughout. When you aren't out exploring the spectacular sights around Kauai, all you need is right at the Kapaa Sands - swim in the ocean water or have an outdoor BBQ next to the pool, then walk the 1-2 blocks to any of numerous dining possibilities. Amazing location right on the ocean! My husband and I came here for the first part of our honeymoon and loved it. The porch is awesome, we loved just sitting and watching the waves break on the beach, and the sunrises were amazing. Having the kitchen was great too bc it helped us save money (food on Kaua'i can be pricey!). Check in was easy, parking was easy, and the place had beach towels which was nice. Overall a great spot! We could not have asked for a more perfect place to stay!! Sleeping with the windows open every night and falling asleep to the sounds of the ocean right outside was truly heaven on earth. Pictures do not do the view justice! Waking up to a Hawaiian sunrise every morning was magical. The location is perfect as well. The drive to the north shore was a breeze as well as heading south and west. We are already dreaming of our next visit to Kaua'i! Great little studio condo for two people! Centrally located on the island. Well equipped. Right on the water with a nice swimming beach. Nice pool. Close to shopping, restaurants and a great bike path along the beach. Staff at Kauai pacific real estate were friendly and easy to deal with. 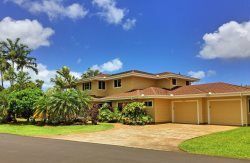 Overall, we had a fantastic experience and would highly recommend this property and the beautiful island of Kauai! This condo was the perfect location! We wanted to stay on the East coast so we could easily explore both north and south. The ocean was closer than it appears in the photos and falling asleep at night with the sound of the waves put us right to sleep. We never had any issues finding a parking spot and the beach felt secluded and tucked away from everything else. Very happy with our stay here! A nice quiet place, with a gorgeous view. We were hapoy with the central location in Kawa'i, and the number of excellent restaurants and beaches within a quick drive, or even within walking distance. We had a wonderful stay. The condo was perfect for the 2 of us! It's literally right on the beach and the gardening of the property is incredible - lots of colors and plants.. well kept. We slept every night with all the windows open and the breeze was amazing. The kitchen had all of what we needed and the bed was new I think which was great because we slept so well. It also had a DVD player which was great for watching movies. Stores are close, BBQ at the pool worked great.. all in all a great stay. Definitely missing the comforting sounds of the waves crashing now that we are back in Arizona. Would definitely stay again without a second thought. Nice accommodation close to the sea, which allows to sleep with the sound of the ocean waves. Safe and calm area. Great view of the ocean! Fall asleep and wake up listening to waves crash right outside your door!